Beyond is a product that caters to families who are looking to find the best financing deals to cover funeral costs while waiting for probate or life insurance to come through and to funeral directors who are looking for a means to free up their cash flow and not worry about shouldering disbursements and other third-party fees that most often pay before the family fully settles their balance. Beyond is an interest-free financing option when the balance is paid within 12 months. It is a viable solution for families who are faced with the unexpected death of a loved one and funds to cover the funeral expenses are inadequate. 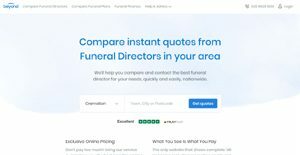 For funeral directors, Beyond helps them provide best and high-quality funeral services to their clients and not worry about not getting paid. Funerals can be quite expensive, especially if you are dealing with the unexpected death of a loved one and don’t have enough funds to pay for the funeral expenses. For funeral directors, families who are not able to settle their invoices on time mean their cash flow suffers as they have to shoulder the expenses long before they get paid. Beyond takes care of that. Beyond provides families with a viable, affordable financing option to help them pay for the costs of their loved one’s funeral. The process is simple and fast and the best part is that Beyond bridges families to hundreds of funeral directors and help them find the best deal. The service puts families in control over what they want to be included in the funeral package. This makes it easy for families who are working within a budget to discover deals that they can afford and suit their requirements. They can also stretch their payment plan from 12 to 60 months. Funeral directors often worry about their cash flow getting frozen when families don’t have sufficient funds to cover all the expenses. Most of the time, they get paid with insurance and the process can be quite long. With Beyond, they get paid in full, allowing them to focus on delivering the best funeral services to their clients. What Problems Will Beyond Solve? Scenario #1: A funeral director needs to pay 3rd party fees such as crematorium/cemetery costs up to 2 weeks before the funeral, and needs to do so on faith that the customer will pay them back. Thanks to Beyond finance, they get the money straight away. Scenario #2: A family is dealing with an unexpected death and are shocked to find out just how much it costs to bury their loved one. They use Beyond to shop around and find the lowest cost but are still a few hundred pounds short. Thanks to Beyond finance, they can pay the remaining balance off over 12 months and not pay a penny in interest. Scenario #3: A funeral director is wary of taking on bad credit and turns away customers. Thanks to Beyond finance, they are protected from this, as the company takes on the risk on their behalf. Since each organization has unique business needs, it is sensible for them to abstain from seeking a one-size-fits-all faultless software solution. Needless to say, it would be futile to try to find such a system even among widely used software applications. The clever thing to do would be to jot down the various vital aspects that require consideration such as key features, finances, skill levels of workers, company size etc. Then, you should do your homework thoroughly. Read some Beyond reviews and look into each of the other solutions in your shortlist in detail. Such in-depth homework can make sure you reject ill-fitting platforms and choose the app that presents all the aspects you require for business success. How Much Does Beyond Cost? Beyond’s SMB and enterprise pricing information is available only upon request. Contact the company for more details, and ask for your quote. We realize that when you make a decision to buy Business Process Management Software it’s important not only to see how experts evaluate it in their reviews, but also to find out if the real people and companies that buy it are actually satisfied with the product. That’s why we’ve created our behavior-based Customer Satisfaction Algorithm™ that gathers customer reviews, comments and Beyond reviews across a wide range of social media sites. The data is then presented in an easy to digest form showing how many people had positive and negative experience with Beyond. With that information at hand you should be equipped to make an informed buying decision that you won’t regret. What are Beyond pricing details? What integrations are available for Beyond? If you need more information about Beyond or you simply have a question let us know what you need and we’ll forward your request directly to the vendor.